Martin Bakole and Billy Nelson aren’t, on paper, two names that you’d associate with one another but, forget paper, because the relationship that they have brings out the best in each other and it really is as simple as that with Nelson relishing the prospect of guiding his Congolese heavyweight to the very top. Billy rang me on Monday, about 10 minutes after he and Martin touched down at the hotel in Sheffield – where they’ve been sparring Anthony Joshua – and Bakole started off by telling me about growing up in Congo, how his father used to be a boxer and that he and his brother, Ilunga Makabu, would bounce off each other trying to be the best. There were relatively few details at this point with Bakole struggling to understand my thick Southern accent so for the duration of the interview I had to rely on Billy, kindly, relaying the questions back in his unmistakable Scottish voice. …but the relationship with Billy is a very good one, I trust him, it’s great, it’s lovely, lovely, I always listen to what he tells me and he knows what he’s doing. My career has moved on since I’ve met him, I’m getting better, I’m having bigger fights. He gets me good sparring and I’m happy”. Billy echoed those sentiments and I asked him just how good Martin was in comparison to his former charges, “Martin is by far the best fighter I have ever trained, he is technically fantastic, naturally gifted which makes my job a bit easier but the most important part for me is just tweaking some of the areas, fight management and guiding him through, he really is a fast learner”. 11 and 0 as a professional boxer, having made his debut back in 2014, there was a refreshing honesty from Martin when it came to that first fight – against Cecil Smith, also making his debut, at Emperors Palace in South Africa – “It was scary, harder than I thought it would be, in the amateurs there are head guards and I wasn’t used to it”. Any fears that he initially had have been long put to bed with the Airdrie resident first fighting in the United Kingdom in August 2016 and having seven fights since, his last two fights have been against DL Jones and Ali Baghouz which, whilst not the highest level of operators, Martin dispatched with quicker than Daniel Dubois and Tony Yoka, respectively, and yet there is a comparative lack of attention being shone on Bakole. Martin interjected at this point, “I think that was my best fight, or the guy I fought before, it’s a difficult name to say (Ali Baghouz), but DL Jones was a good fight, I got a very good knockout and it made me happy”. Finding opponents is an area Martin doesn’t have to worry about, with the Congolese giant saying, “I don’t mind who I fight, I will not pick, I just want to fight” but it is something that causes Nelson nightmares, “we’ve offered Dave Allen the fight two or three times but he won’t take it, he was a bit derogatory to Martin but we made up and sparred two rounds and that’s really concreted that he won’t fight Martin, after that. 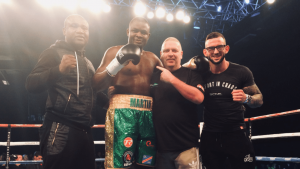 The thing is that Martin has been round the country to spar, he sparred Tyson Fury a few years ago, Dillian Whyte called off sparring the night before, everyone knows what Martin has done in sparring and I got a coach telling me “play the game”. I told him “we don’t play games”, we’re here to spar Anthony Joshua for the next week but Martin doesn’t seem him as a sparring partner, they both need quality sparring and you’d pay good, good money to watch the spars”. That confidence was expanded on when he opened up about sparring with Anthony Joshua, “it gives me good confidence, no-one else wants to spar me but Anthony Joshua and his coach know that I am the best so when I spar him it is very good sparring, high level and it keeps me focussed. Helps my intelligent and he always texts me after sparring saying thank you and it gives me confidence going into my fights”. Despite hailing from the Congo, Bakole will be eligible for a British Boxing Board of Control License from next year, allowing him to fight for domestic and European titles, and I asked him if that was a fight (Agit Kabayel) that interested him, “I think I am better than that level, I am higher than that”. It was pleasing to hear the quiet character showing such confidence and Billy was happy with the progress made under him, “the guys just don’t want to fight him but he’s knocked Akinlade, Baghouz, DL Jones out in one round and the only guy to go the distance under me was Sokolowski, no excuses that day because we travelled from Scotland to London at about 6.30 in the morning – I had three in title fights the night before but Martin didn’t want to go down with anyone else – and he gave that guy a hell of a beating, broke his nose, the worst broken nose I’ve ever seen and Sokolowski is one tough guy”. I asked him what he thought of fighting on TV and in his new home country of Scotland, “It is nice to be on TV, people watching me live and it makes me feel nice, thank you to them for watching and for Cyclone Promotions. I love fighting in Scotland. I like the people here, they make me feel loved and happy”. The last word, fittingly, should go to Bakole who had a very simple, emphatic answer for me when I was cheeky enough to ask if anyone could beat him – “NO”.